Is your German Shepherd the correct weight and height for their age? Knowing how much your dog weighs will help you know if they are developing properly. It can also alert you to a potential problem early so you can get your puppy to the vet as soon as possible. Read on to find out everything you need to know about German Shepherd development, weight, and height! How Big Should a German Shepherd Be? How Much Should a German Shepherd Weigh? What If My German Shepherd Isn’t the Right Weight? Before we get to the weight and height charts, let’s take a moment to study the developmental stages all puppies go through. It’s crucial to watch for each of these milestones as they come. These, more than weight or height, will help determine if your German Shepherd puppy is developing normally. During this stage, a puppy is mostly helpless, and the mother will be responsible for feeding them, keeping them warm, and helping them eliminate waste. Now that puppies can interact with the world and creatures around them, they begin to do so. It’s vital to begin socializing puppies at this point to become accustomed to humans. Puppies should remain with their mother during this entire period even if they’re already weaned. There are dog social skills that the mother teaches her puppies during this stage. If they are taken from their mother too early, they may have trouble interacting with other dogs later in life. At this point, puppy development begins to slow down as they have done most of the developing they need and will now primarily just grow larger. Near the end of this stage is when you’ll want to start puppy classes and start training your puppy. As you already guessed, this is the point at which your German Shepherd will reach sexual maturity. By the end of this stage, they will mostly look like an adult dog, though they’ll still have some growing to do. The most important thing you should do for your dog at this point is spay or neuter them. If you are planning on breeding your dog, then you’ll need to make sure they have good hips and overall formation to improve the breed. At this point, there are no more major milestones for your German Shepherd to reach. They will, however, continue to grow during this time. 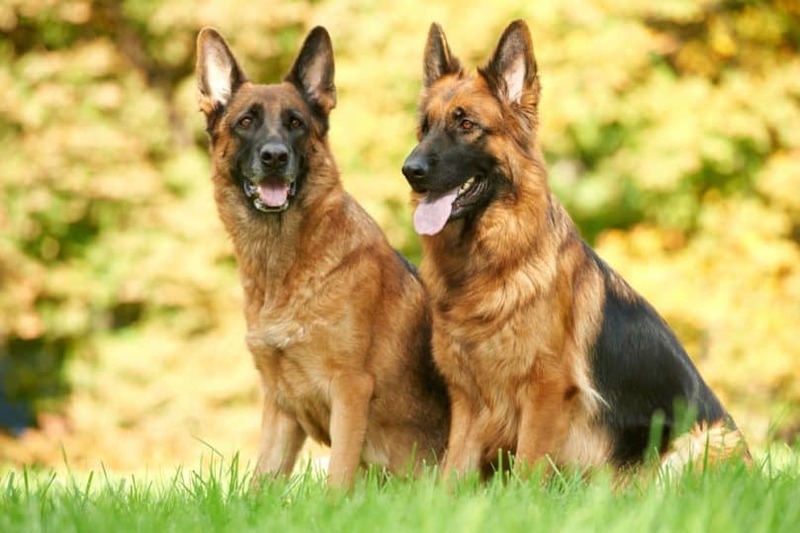 Female German Shepherds aren’t considered to be fully-grown until they are at least 24 months whereas some males aren’t seen as adults until 36 months. Throughout this period, you should continue to feed them a high-quality diet to ensure that they grow at the proper rate, allowing their hips to develop normally. By the end of this period, they should reach their adult weight. While the vast majority of German Shepherds will fall in this range, there are exceptions. Your veterinarian or else an experienced Shepherd breeder can tell you if your dog is the right weight for their age and height. These charts will show you what your German Shepherd puppy will weigh as they grow to reach adulthood. One is for male puppies and the other for females. Something to keep in mind is that dogs grow at different rates, so they may not reach the next weight milestone by that month or may reach it sooner. As long as they’re close and don’t have other problems, it’s normal. The height of a German Shepherd is always measured at what is known as the withers, which is the part of their back right above their shoulders at the base of the neck. This is the tallest point on the dog’s body when they’re standing. The head is never included in animal measurements because it’s too hard to get them to stay still with their head in a fully-upright position. For this reason, horses, dogs, and other animals are always measured to the shoulder. You can use this chart to check to see if your German Shepherd’s growth is on track. As with weight, there will be some dogs that fall outside of the ranges listed here, but that’s normal as long as your dog is otherwise healthy. 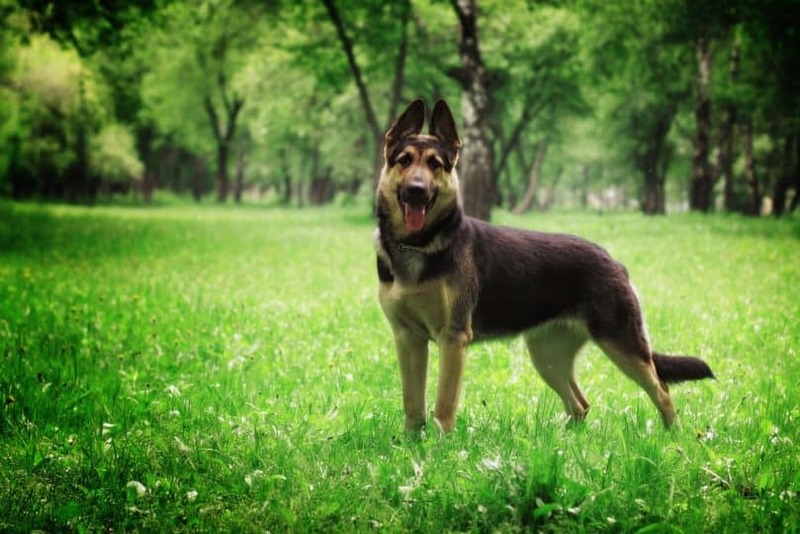 Unlike many other breeds, the German Shepherd has very specific standards when it comes to their proportions. While weight and height are important, what matters more is that they’re the right ratio. To find out if your dog is the right ratio, you need to measure their length from the front of their chest to the base of their tail. You’ll also measure their height at their withers. A German Shepherd should have a length/height ratio of 10:8.5. That means they should be slightly longer than they are tall. To find the ratio, multiply their length by 0.85. This should give you their height. For example, 26 inches times 0.85 is 22.1 inches, so you know that dog is proportionate. Using the other example, 30.5 inches times 0.85 is 25.9 inches. Since each dog is going to be different, you need to look at their overall body condition rather than a weight range. Fortunately, there are body conditioning charts that you can use to figure out if your German Shepherd is at their ideal weight. As you can see, it’s easy to determine if your German Shepherd is at the proper weight. Just look at them from the side and from above, feeling for ribs and pelvic bones when necessary. While German Shepherds are generally thinner compared to other dogs of their size, you still shouldn’t be able to see or easily feel their ribs. Younger dogs will also typically be on the thin side before they fully fill out as adults. Something that may determine your German Shepherd’s overall body conformation is whether they were bred to be a show dog or a working dog. 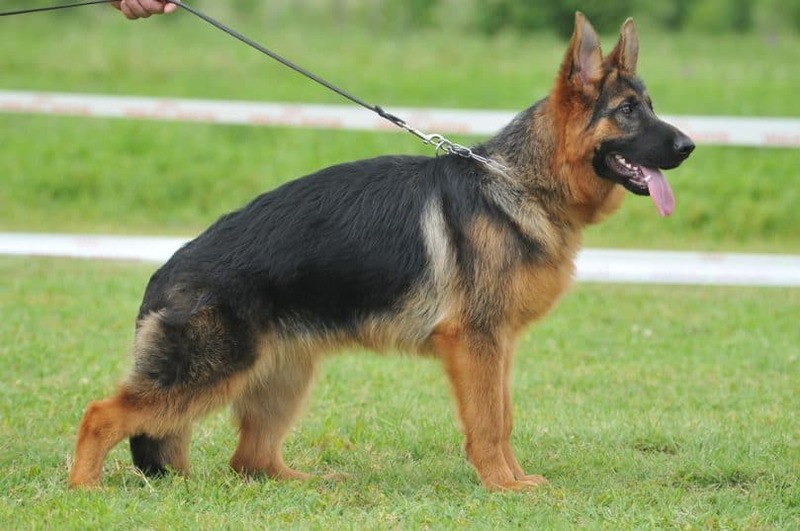 Years of line breeding has produced several distinct types of Shepherds. Show dogs are known for a sloped back in which the back legs are shorter than the front. This unnatural formation can cause back and hip problems along with an abnormal gait. 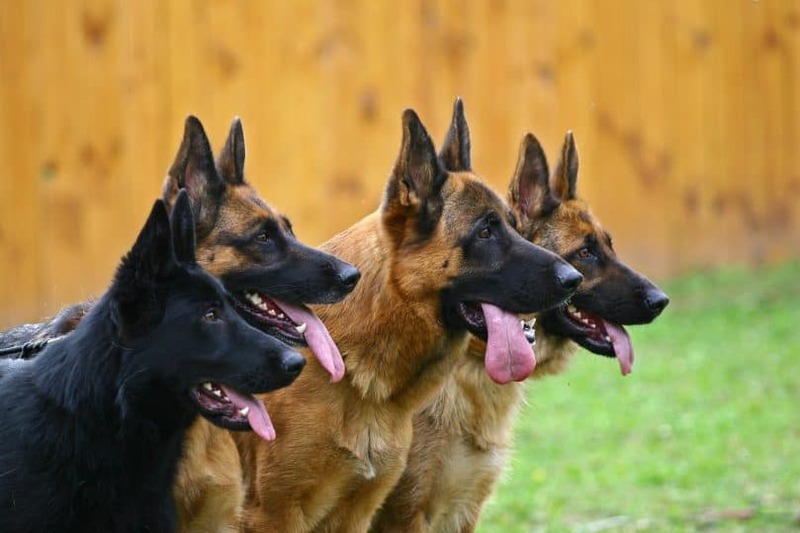 German Shepherds bred for show will also be thinner than their hardworking cousins. As you can see in this picture, this is a show-bred German Shepherd with an obvious curved back and short back legs. Working dogs, on the other hand, are bred for a sturdy, straight back so they can work long hours without getting sore. They tend to be thicker than show dogs and will, therefore, weigh more, even at the same height. As you can see in this picture, this dog has a straighter back and longer back legs, so it has been bred for working. Something else I wanted to mention here is that, according to some sources, Black German Shepherds are larger than their bi-colored cousins, despite being otherwise the same. It’s hard to prove for sure, but it’s possible that their recessive genes that carry the black gene may also contribute to a larger size. White German Shepherds, on the other hand, aren’t known for being any different in size than other dogs. So, if you have one of these rare and beautiful creatures, you can follow the same charts that were listed above. Here’s another video of a German Shepherd growing up that’s a lot of fun to watch if you’ve got a minute! If your German Shepherd is diagnosed by a veterinarian as underweight or overweight for their age, then the first thing you should do is ask him or her to help you figure out the underlying cause of the problem. This will determine what should be done next. Hopefully, this has answered all of your questions about German Shepherd weight and height. As always, if you have any concerns about your dog’s health, you should consult your veterinarian as soon as possible. Do you have a giant German Shepherd? What about a tiny one? 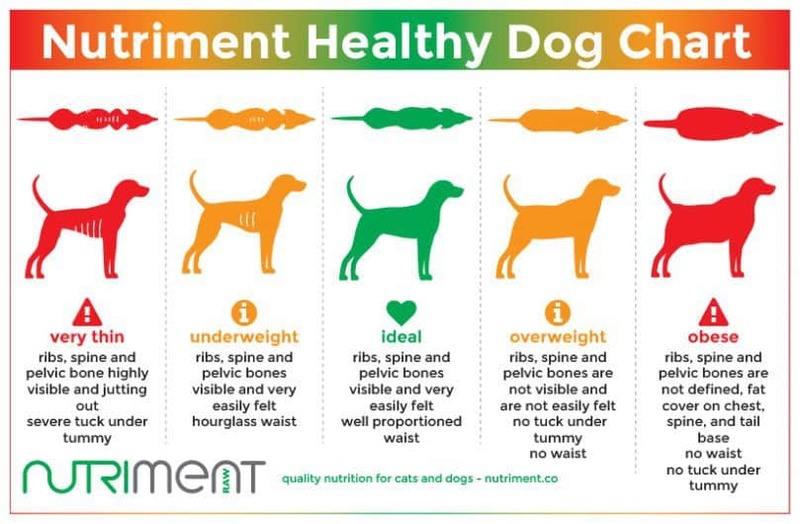 Either way, we’d love to hear about how your pooch measures up on these weight charts. Comment below to tell us more about it! I just wanted to say that I have studied German shepherds and bred them for a long time. American German shepherds have straighter backs then German shepherds. If you have a german shepherd and their lineages are close to their German roots they will have that arch in their back. It wasn’t until Americans started breeding them that they started working on straightening their back.